As a solutions architect for Amazon Web Services, one of my responsibilities is to help our customers to learn about new features and capabilities of our services. Amazon RDS makes it possible to set up, operate, and scale relational databases in the cloud without having to focus on time-consuming administrative tasks. 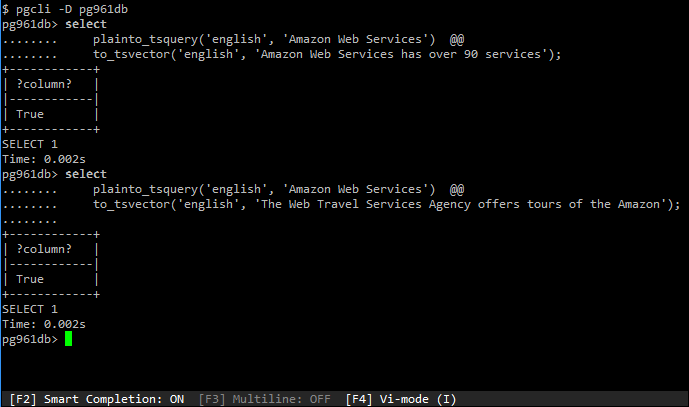 Amazon RDS recently announced the support of PostgreSQL 9.6.1. In this blog post, I will discuss two of the features included in this release: the ability to perform parallel queries and phrase searches. Parallel queries make it possible to use multiple CPU cores to speed up the execution of queries by creating multiple worker processes. Each worker process performs the query on a subset of data. The results are then combined to produce the final query result. 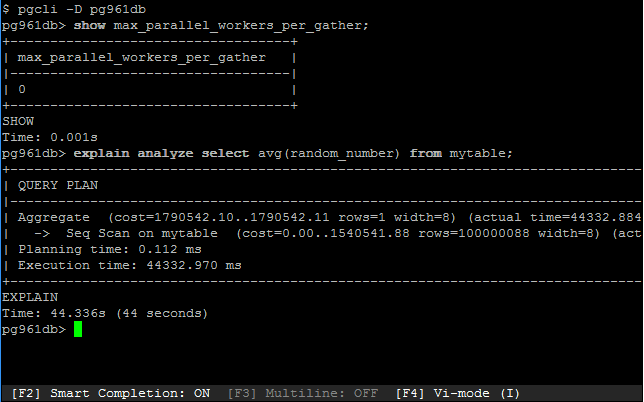 The number of worker processes is determined by the value of the parameter max_parallel_workers_per_gather. 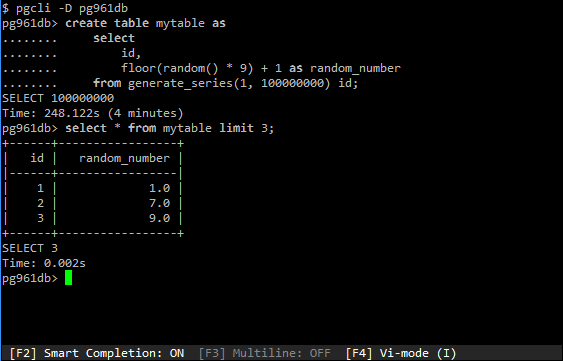 The default value of this parameter is 0, which disables parallelism. In the examples that follow, I’ve created a VPC with a PostgreSQL RDS database on a db.m4.large instance class with 2 vCPUs and 8 GB RAM. I’m going to use pgcli, a command line tool for PostgreSQL, to interact with the database named pg961db to create a table. 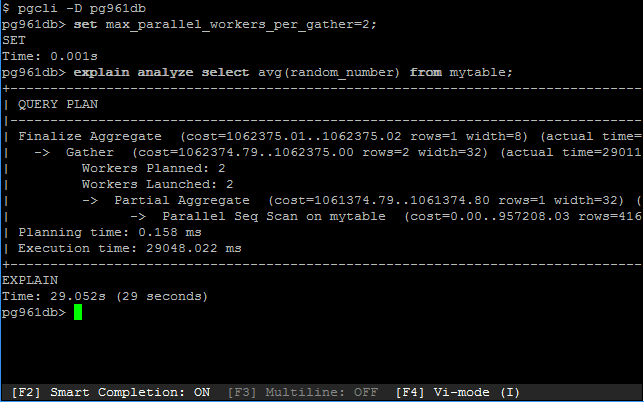 In this example, max_parallel_workers_per_gather is set to 2 to enable parallel queries. The output from explain shows that two workers have been launched and that the total processing time was reduced to approximately 29 seconds, a 34% reduction in the time required to perform the same query with only one worker. This example shows how parallel queries can reduce the processing time of queries using multiple workers in a divide and conquer manner. This is especially useful when processing aggregate functions such as avg() in the preceding example. The resulting increase in efficiency will depend on a number of factors, including the data itself, the specific query, and the database instance class. The query string contains the same three lexemes, but with a new ordering operator <->, which means “is followed by.” For a match to occur, the three lexemes must appear in the correct order. This capability makes it much easier to refine searches and produce the most desirable results. Amazon RDS for PostgreSQL version 9.6.1 brings the latest capabilities of PostgreSQL to the cloud as a managed service. The parallel query feature can increase the performance of searches by using additional CPU capacity to run multiple worker processes. The phrase search capability provides for a more tailored search experience where the specific order of terms is required. It’s easy to get started. Use our Getting Started Guide to create your PostgreSQL database in just a few clicks.